The old adage of “Simplify, simplify, simplify.” is especially true when managing mobile devices. Whether in a classroom or a corporation, less time and effort spent managing devices translates into more time they are in use by students or staff. The Automator actions for the Apple Configurator application, make it easy to create and apply automation recipes for mobile device setup, dramatically reducing the complexity and time it takes to keep your mobile devices mobile. Apple Configurator—a free OS X application, available from the Mac App Store—enables administrators to conveniently set up and configure multiple iOS devices at once via USB before providing them to users. With this tool, your institution can quickly configure and update multiple devices to the latest version of iOS, configure device settings and restrictions, preconfigure MDM enrollment, and install apps and content. Apple Configurator is ideal for scenarios in which users share iOS devices that need to be quickly refreshed and kept up to date with the correct settings, policies, apps, and data. Who should use Apple Configurator? Ideally, system administrators or other IT professionals would responsible for the setup and maintenance of mobile devices. However, in many of today’s resource-constrained environments this is not always the reality. Not everyone who is tasked with managing iOS devices, can be assumed to have a working knowledge of the Terminal, Profile Manager, advanced MDM software, or even a more user-friendly tool like Apple Configurator. Quite often, the person assigned to manage the devices, is no more technically proficient than those who use the devices. Therefore, it is very important to develop and implement easy-to-use tools that enable everyone to quickly and effectively manage collections of mobile devices. 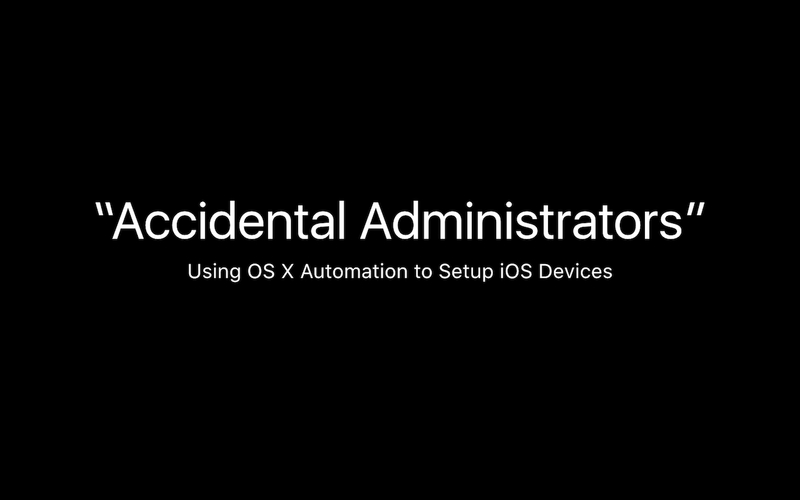 With Automator and the Apple Configurator actions, creating powerful workflows for device management is accomplished using a simple drag-and-drop process, the results of which can be executed from the system-wide Script Menu or by simply launching an Automator workflow applet. If you’re not already familiar with Automator, read the Automator Quick-Start guide page before continuing. The video from WWDC 2015 Session 306 Supporting the Enterprise with macOS Automation.